This week we talk about an absolute must-learn exercise for anyone who wants to increase their knowledge of chords and gain the kind of technique that will have you flying all over your instrument with ease. These exercises are a mix of knowledge you need in your head and dexterity that you need under your fingers to feel more free when improvising. 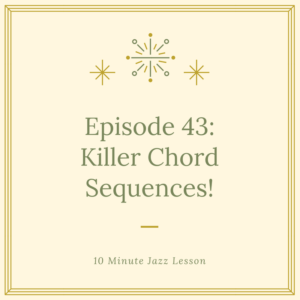 We start by learning a great chord sequence over a major-seventh chord that requires you to work on your chromatic approaches. We then move into another exercise that utilizes a minor-seventh chord and gives you an approach to begin using the 13th over this tonality. These exercise are great for anyone at any level. Make sure you move slowly and methodically through them and always apply them to a real life situation once you feel comfortable enough. Enjoy the episode!